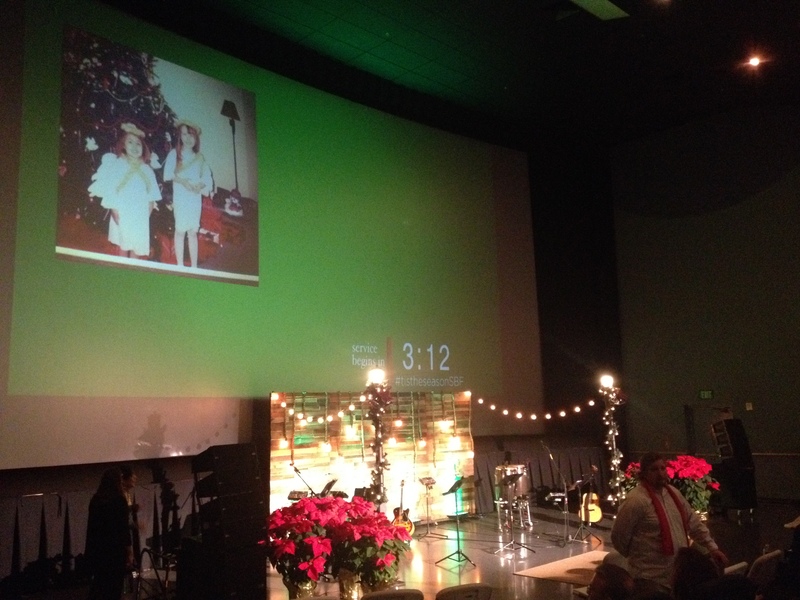 This year we held our Christmas Eve services in our regular meeting space – a movie theater. In previous years, we’ve rented venues that were large enough to hold our entire church (about 700 people) but none were available this Christmas. Even though we knew the space itself would present some challenges, we felt it could be strategic as many people would be out shopping and even attending movies on Christmas Eve. So, we plunged forward. Because each theater has limited seats, we used Eventbrite and had people reserve tickets. We set the limit at 15% above seating capacity, knowing that some would take more tickets than they needed. Next year, we could probably set it closer to 20-25%. Tony Morgan has a great article about Christmas Eve tickets. We had a live venue and a video venue, just like we do on Sundays. Attendees could reserve tickets for either time. This allowed us to maximize seating for that night. We opened the theater doors 15 minutes prior to the start of the service so folks were lining up around the building. This created a lot of buzz and excitement outside. Making a movie theater look and feel “Christmasy” was a bit tricky. Movies were still playing that day so we only had about an hour to set up the actual theaters. Thankfully, we were able to get into the lobby space at noon. We shared the lobby with movie goers so we created a distinct entrance for those attending the service. A very generous church member donated Christmas trees and poinsettia to help make the theater feel more like Christmas. Hospitality team members were scattered throughout to assist and answer questions. We passed out 4×6 invite cards two weeks prior. We created a landing page on our website with all the information and pointed people there to reserve tickets. We placed a banner ad in the lobby of our movie theater 3 weeks prior with our Christmas Eve design and service times. We placed a large emphasis on personal invites and social media sharing. At the end of the Christmas Eve service, we passed out invite cards to our January sermon series. 6×9 bulletin with a tear-off connection card. We printed a 6×9 perforated card for our bulletin. The front had information for first time guests and our Christmas offering. The back had space for notes. We keep it simple so people could focus on the gospel message, without the clutter of announcements. Pre-service countdown included pictures people had posted as part of our social media contest. Since our sermon series was called ‘Tis the Season, our Lead Pastor approached me about creating a social media contest where people submitted their best Christmas photos…whatever the Christmas season meant for them. We created a hashtag, picked a few winners and announced them at the service. The winners got a free Southbridge t-shirt and a Starbucks gift card. We also streamed photos in for our pre-service countdown. Christmas Eve is always my favorite night at our church, and this year was no different. Our amazing volunteers stepped up to serve, the gospel was shared and people accepted Christ. What about you? How did your church celebrate Christmas Eve?